1. Preheat the oven to 180°C (350°F) Gas 4. 2. To make a papillote bag, cut a rectangle of baking parchment approximately 30 x 45cm and a piece of foil 40 x 55cm. Place the baking parchment on top of the foil and fold in half. Seal the sides by folding the foil over several times, capturing the baking parchment inside, forming an envelope. 3. Carefully place the carrots, shallots, pak choi, daikon radish or red radishes, chillies, galangal or ginger, lemon grass and green beans inside the envelope and add the rice wine. Seal the top and put on a baking sheet. Bake in the preheated oven for 20 minutes. 4. 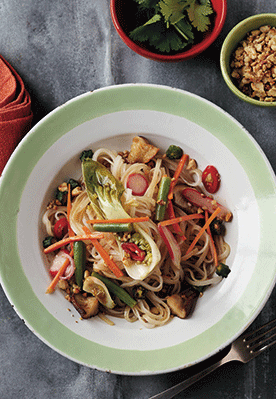 While the vegetables are cooking, prepare the noodles. Preheat a large frying pan over a high heat with just enough vegetable oil to coat the bottom. When the oil is just starting to shimmer from the heat, add the okra and mushrooms. Cook for 3 minutes, turning occasionally, until the okra is starting to turn golden. Add a good splash of sesame oil and then the noodles. Reduce the heat to low and turn the noodles in the pan to warm them through and mix with the okra and mushrooms. 5. To serve, place the papillote bag in a large bowl and rest for 5 minutes (don’t serve the lemon grass or galangal or ginger pieces). Put the noodles in another large bowl and dress with a little soy sauce. Put the coriander leaves and cashew nuts in smaller serving bowls. When you open the papillote bag at the table, it will fill the room with wonderful aromas. Allow your guests to help themselves for the perfect balance. Recipe and image taken from Vegetable Perfection by Mat Follas, priced at £16.99 and published by Ryland Peters & Small. Photography by Steve Painter. Vegetable Perfection will be available to Your Healthy Living readers for the special price of £11.99 including postage and packaging by telephoning Macmillan Direct on 01256 302 699 and quoting the reference GL5.